Today I woke up early to finish some last minute packing and get ready to leave Glover’s. We said bye to the staff and the cooks even gave us some cinnamon bread for later. Then we headed out on the boat to visit the Smithsonian research center and mangroves. At the Smithsonian, we met Clyde, the station manager, and one of the researchers staying at the station as well. She was studying hybrid elkhorn and staghorn corals and how they can withstand high temperatures. Then, Clyde gave us a tour of the station and showed us some the things the experiments the researchers had set up. 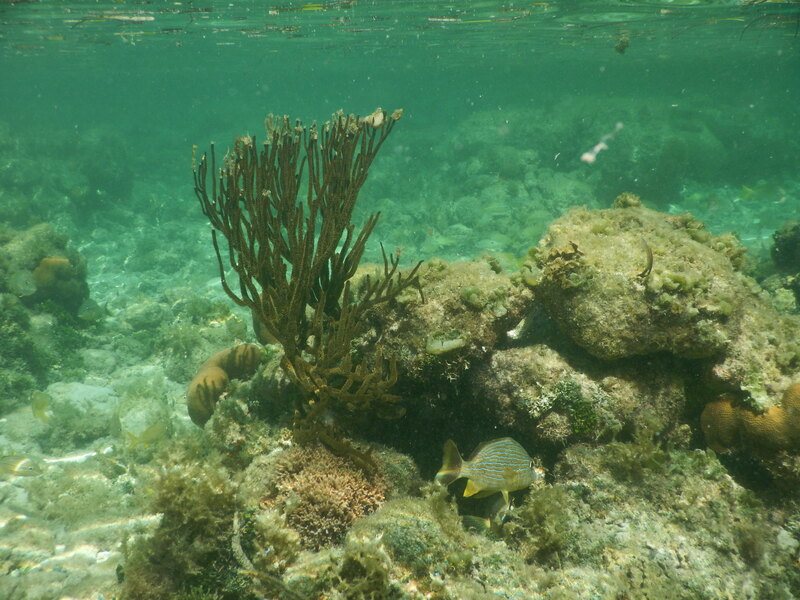 Then, we went to the Mangroves and got to snorkel around the roots of the trees and see all the algae and sponges that were growing in that environment. 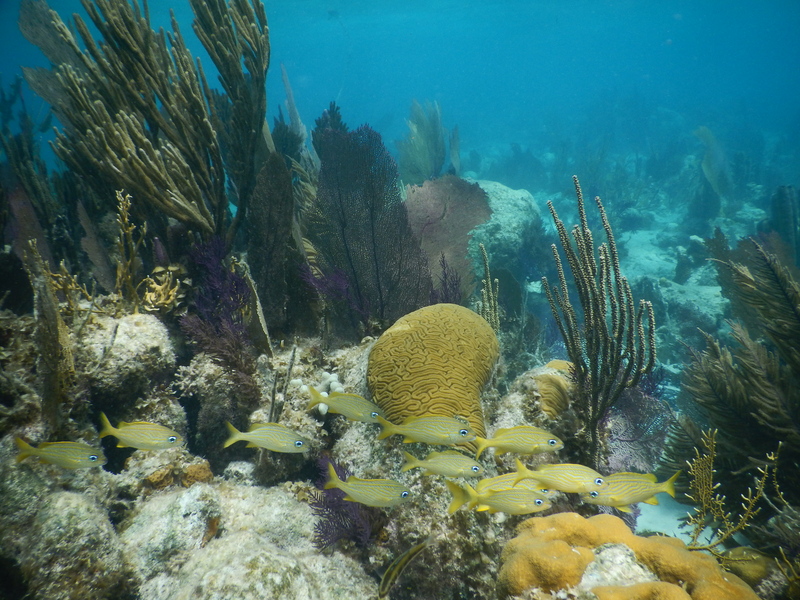 We didn’t see any seahorses or manatees but it was still a fun last snorkel. We boarded the boat and finally got back the Belize city, where we had a fun last lunch at Calypso restaurant. Then we had to say goodbye to Rose and Jahvier, and head to the airport. Leaving Belize was so hard, and saying goodbye to everyone at the airport was even harder, but I’m so glad that so many people will be in Houston over the summer. Today I woke up later but had amazing french in the morning which was great. Then we had time to pack and clean and get ready for lionfish dissections. Me and Kristen got the second biggest fish and were able to look inside at its stomach contents, but we weren’t able to identify anything specific. Afterward, I finally got a hammock and was able to get caught up on my journal, then Scott came down with lionfish ceviche that he made, and all the vegetarians tried it including me because lionfish are an invasive species and shouldn’t count. Around 2:00 Elena, Jessica, Veronica and Same went out to snorkel one last time just for fun. It had been so hot so getting in the cool water was really nice, and we got to explore some patch reefs near the island. 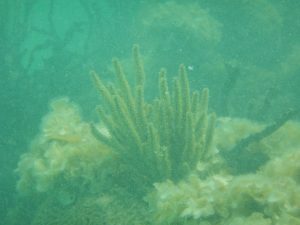 I once again saw a lot of corky sea fingers and sea fans, as well as some swollen-knob candelabrum, that I had to swim pretty close to identify. We also saw some huge lobsters as well. I quickly rinsed off once we got back to the island, and then we left for the Southwest Caye for a fun, secret TFB tradition. We took cute pictures, Rose taught us some dance moves, and we all signed a Rice shirt to hang up in the bar. Today I woke up to the sound of a rainstorm. We had breakfast and then gathered in the classroom to do our last lectures and wait for the rain to die down. After lectures, the rain had let up enough so we could work on our marine debris project. We went to the coral graveyard on the windward side for 15 minutes and all picked up and identified trash, and then did the same thing in the mangrove forest on the leeward side. It was upsetting to see how little of a dent we made and how the trash will just continue to accumulate. I definitely want to start to live with less waste back home. A 2:00 we went out on the boat for our last snorkel in the atoll. We first went to a site called the Aquarium, and it really did look like we were snorkeling in an aquarium tank. There was so many beautiful fish and I was able to get some really good pictures since it was easy to dive down. 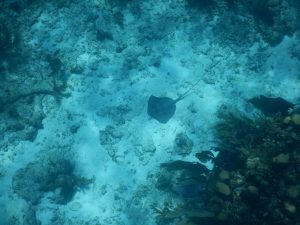 I also saw a Southern Sting Ray swimming over the reef, which was really cool and it looked really pretty. 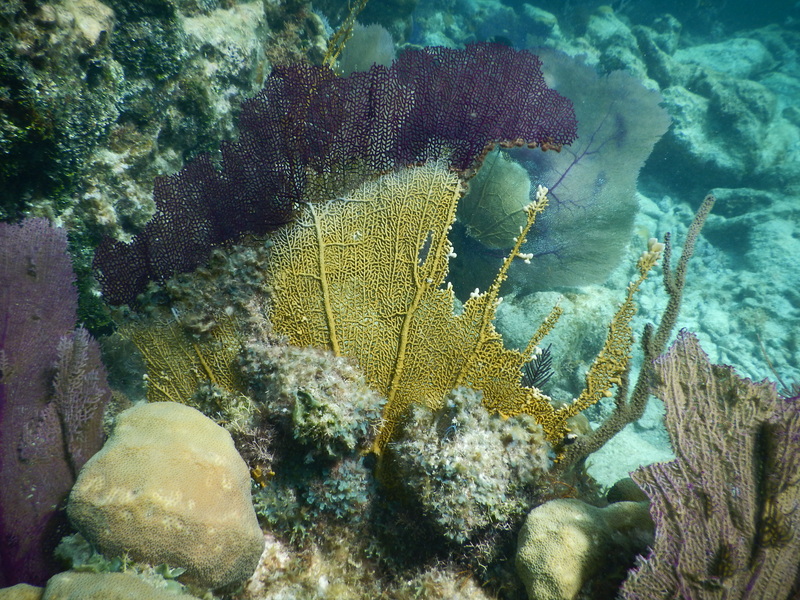 The second patch reef we went to was deeper, and it was really fun to dive down and swim close to the ocean floor. We also saw a large nurse shark on the sea floor, but there was a string with a can on it attached to the shark, and there was nothing we could do to take it off. Then, we went to a different reef and I saw a black tipped reef shark, which was also really amazing. Today there was a lot of sea fans that were packed very close to each other, and some of them were bright purple while some had a very dull grey color with just a purple tint. Most of them were on the top of the rocks, but some small ones were on the seafloor. I also saw some really pretty sea plumes, whose colonies were large and had long branchlets. Today we woke up to banana and pineapple pancakes, which were so good! 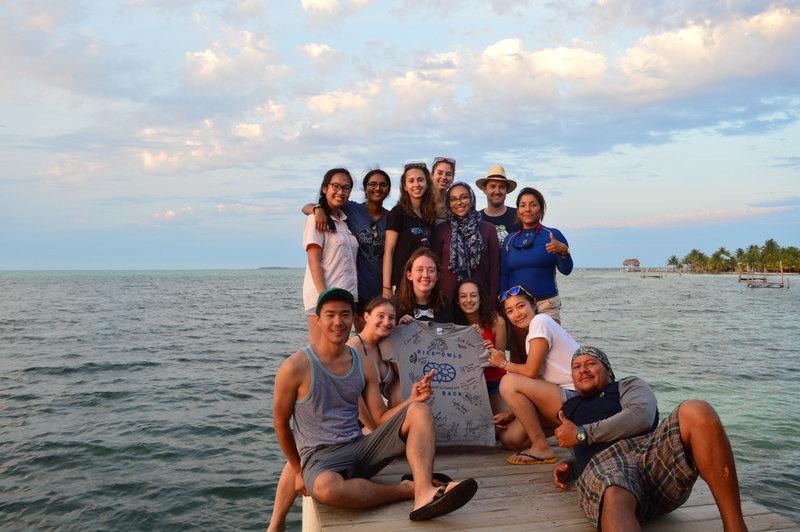 Then we spent the next couple hours working on our poster, MP-Yay for Coral Reefs, where we analyzed our data from the hard coral coverage experiment and the sea urchin coverage experiment to see how the MPA affects marine health. We presented our poster to Scott around 11:00 and then did one of the taxon lectured before lunch. After lunch, we did the last 2 lectures of the day, which was nice because we were all less tired and didn’t have to worry about them at night. 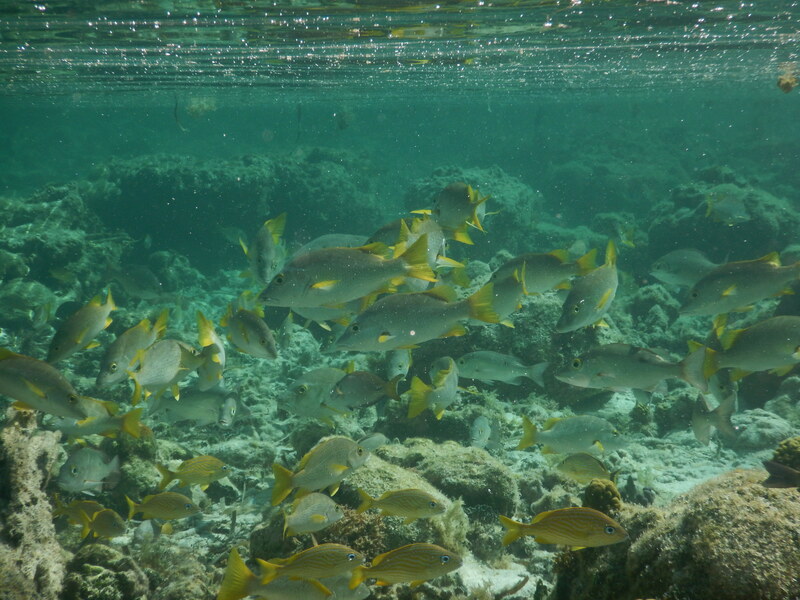 Then we got ready to wade into the back reef, behind the island. The second we started to wade through the marshy beginning, closest to the island, there was a resounding groan. The water was extremely hot and was burning everyone’s cuts and scrapes, as well as pretty gross to walk through. 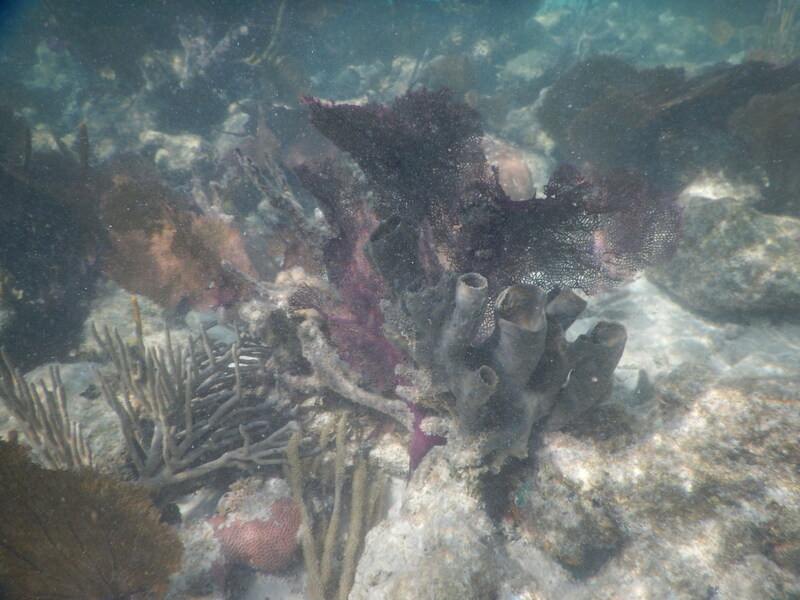 Once we got to the seagrass, it was a bit cooler and I saw a bunch of conch shells and some anemones. We swam further to the actual reef part and the amount of fish, anemones, and coral we saw made it totally worth it. There was an opening through the coral where there were schools of 30-40 fish eating the algae off coral. We put a bunch of our finds into a bucket, and once back on shore the people who had taxons that we could collect separated them out. 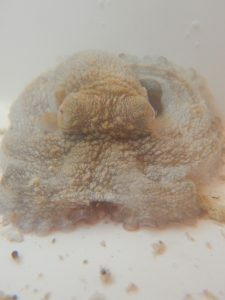 We even found things we weren’t expecting to, including a tiny octopus named Herman. 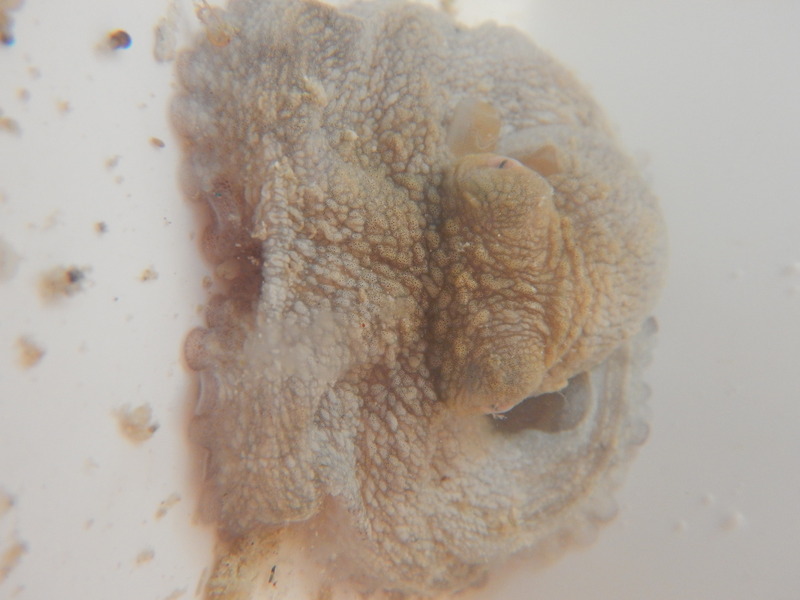 It was so cute and kept changing colors when disturbed, so it finally made himself very compact and tucked all his tentacles under his body. 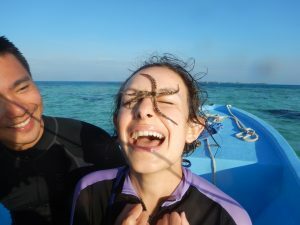 After the mini taxon presentations, we released everything back into the ocean, including Herman and some Donkey Sea Dung cucumbers that I got to throw back to the sea. 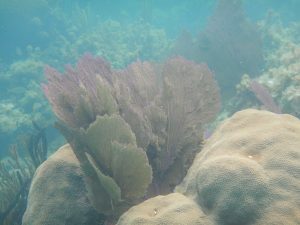 In the back reef, I once again saw a large number of sea fans, but most of them weren’t as big as yesterday, as well as corky sea fingers, which were usually clustered together in a colony of 3 or 4. I also saw some black sea rods and porous sea rods that varied in color from greyish to purple tinted. Some of the porous sea rods I saw could have been slit pore, but I was having trouble distinguishing some of them. After breakfast today, we left on the boat to explore the floor reefs past the island. The first site we stopped at was beautiful and there were so many large corals, however I started to get sea sick and by the time we got to the second site I felt like I was going to throw-up in my snorkel mask. I still got out to swim around and the reef was really pretty, I just felt like I couldn’t be completely present since I wasn’t feeling great. 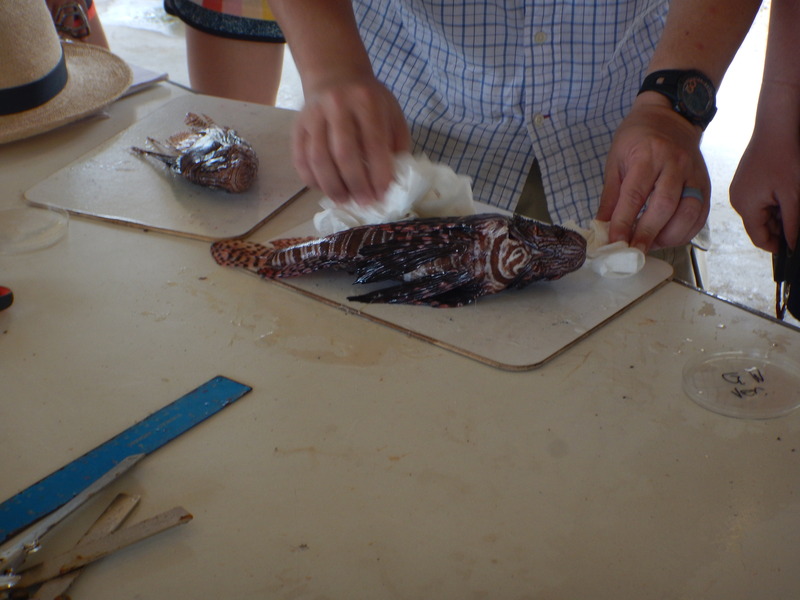 It was still cool that Scott was able to spear a lionfish and we might get to dissect and eat them later. We came back to the island because people were feeling sick and had time to rest before lunch. After lunch, Scott gave us more time so everyone took a nap and when I woke up I didn’t feel sick anymore. 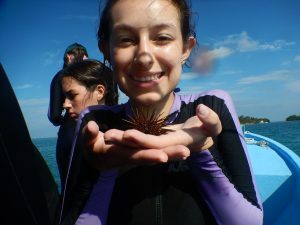 We went back out on the boat to collect sea urchins to compare the percentage of sea urchins in the MPA and out of the MPA. We stayed in the atoll so the ride was a lot smoother and the 2 patch reefs we saw were a lot shallower. We got a ton of sea urchin and I got to hold some in my hand and see them move, also Claire found a sea egg which was one of the cutest marine organisms ever. While in the reef I saw a bunch of the common sea fans that were mostly purple, and one was a really intense purple and huge. I saw less Corky Sea fingers today in the reefs today, there might have been some in the floor reefs, but since it was so deep and I wasn’t feeling well I could dive down. I also saw some pretty large sea plumes that were also a light purplish color. Today I got to sleep in because breakfast didn’t start till 7! After breakfast, Scott had us practice using our research equipment on land before we got in the water. We looked at the proportion of dead leaves on the main trail of the island. Once we were confident with using the transect tape and quadrats, we got ready for using it in the reef. Putting on the dive suit over an already sweating body was a struggle, but once I had all my gear on I headed to the dock. Once in the water, we used the same technique with the quadrats and transect tape in the sea grass to find what percentage of the benthos contained worm mounds. On the way out of the water, I realized I lost my clipboard and had everyone looking for it, but Elena ended up finding it right in front of the ladder in the sand (sorry everyone:/). After a delicious lunch, we headed to what Scott told us was Adrienne’s favorite spot, the Coral Graveyard. It was really interesting to be able to identify the different hard corals and also me and Jessica found beautiful pink conch shells and pretended we were in Moana. 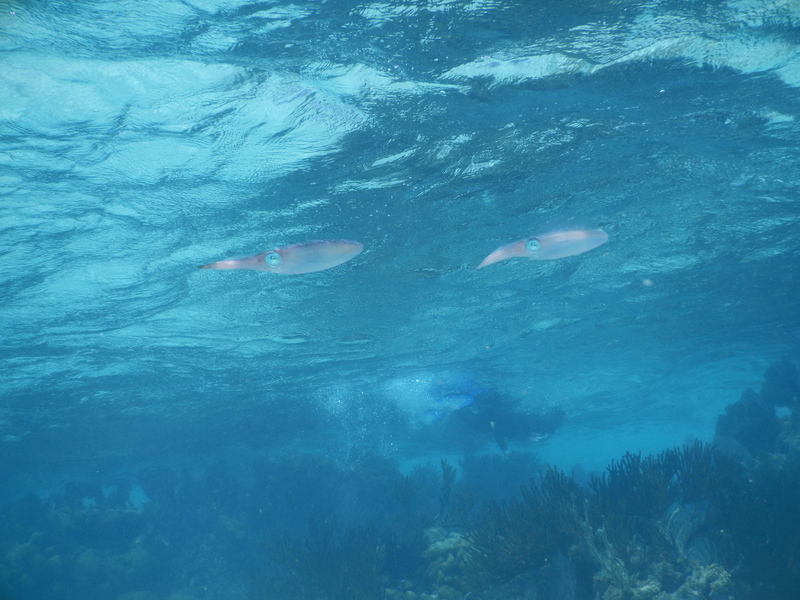 Then we headed back into the water, to repeat the same experiment but with measuring the proportion of hard corals. 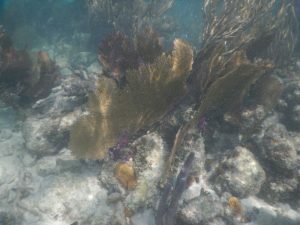 We went to one patch reef in the Marine Protective Area which was pretty hard to maneuver in since it was really close to the surface. The second reef we visited was outside the MPA and was a lot deeper than the first so it was easier to swim and use the equipment. I really felt like a real marine TFB being able to use the quadrat and tape, and swim so close to the coral. 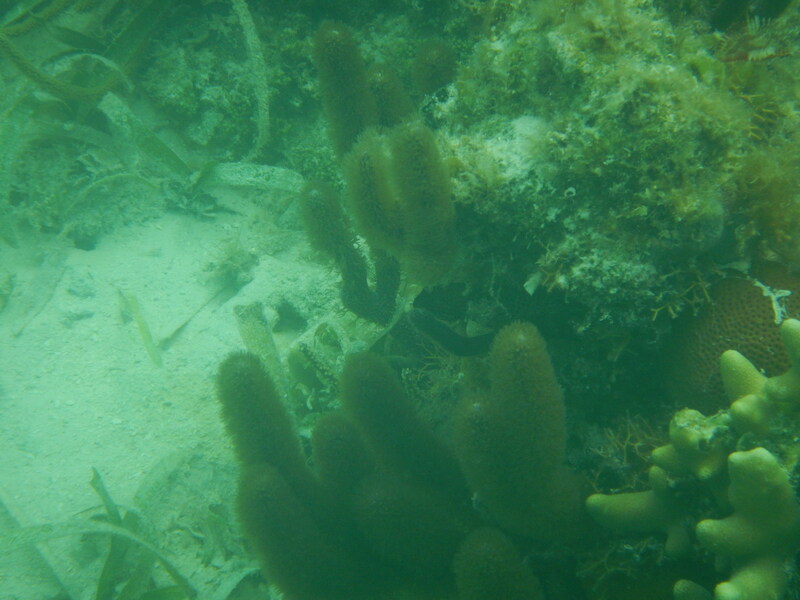 While at the different patch reefs I saw a bunch of the corky sea fingers and purple sea fans. I also got to see some bipinnate sea plumes as well as some sea rods, however it was hard to tell which type of sea rods they were, but I definitely spotted black sea rod. Today, I woke up and packed up my things in preparation for going to Glover’s. We left the Tropical Research Center and began the drive to the marina. The drive was only an hour to Belize City and once we got there we pulled up to a casino, that had the marina and dock behind it. We all boarded the boat and had a three-hour boat ride to the research station. On the boat ride, we met Javier and Rose, who are going to be our marine safety officers. I also was able to see the beautiful ocean water changing colors as we got further from the mainland and closer to the island. We finally arrived at Glover’s and got settled and a toured the island. Then got ready for our first time snorkeling in the water. We swam over the sea grass near the dock and saw a yellow-spotted stingray and upside-down jellyfish. After practicing we headed back to the dock on saw a really tiny baby nurse shark, which was adorable. On the reef patch, I saw a bunch of corky sea fingers on the edge of the patch, as well as common sea fans, which all varied in sizes and shades of purple throughout the patch. I’m so excited to spend the next week here! 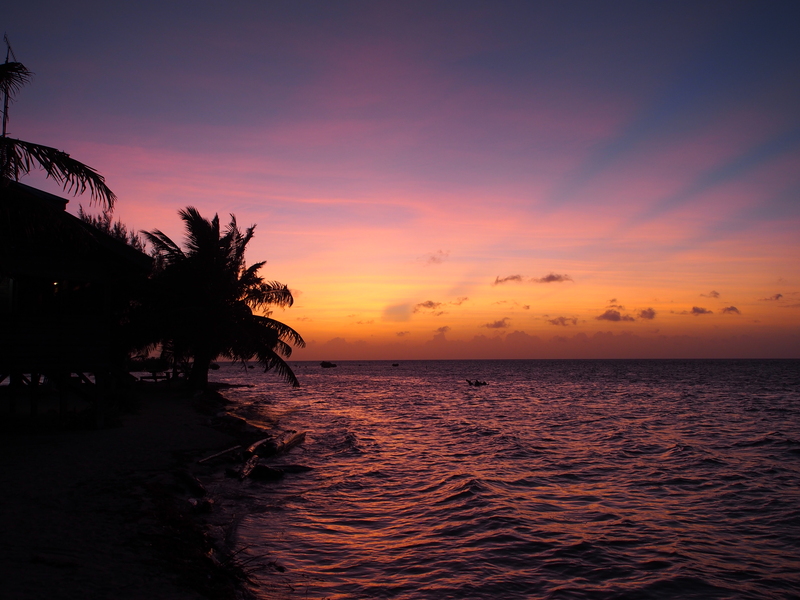 After spending two weeks in Belize immersed in coral reef and tropical rainforest environments, I’ve gotten much deeper insight into these two ecosystems which have always fascinated me. I was surprised to learn that such biologically diverse ecosystems exist in nutrient-poor conditions. 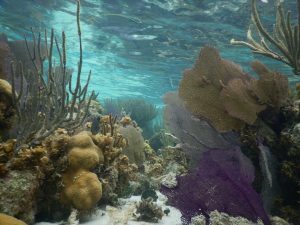 I always imagined that there would need to be a nutrient-rich foundation to sustain the plethora of organisms that live within each ecosystem, but that’s not the case – actually, for the coral reef it can be quite harmful. The stony corals that form the reef thrive in nutrient-poor environments and, as Ellie told us, if too many nutrients enter the system, the reef will undergo a phase shift which means that it will become overrun by algae. In the case of the rainforest, Sarah T. gave us the lowdown about how there is only a very thin layer of soil (the topsoil) which contains most of the available nutrients. The low levels of nutrients are caused in part by rapid nutrient recycling; as nutrients become available, they are quickly used by the many organisms that inhabit the two ecosystems. Another similarity I noticed between the two ecosystems is how many symbiotic relationships there are. This is likely because the high species density in coral reefs and rainforests brings many organisms into close proximity, resulting in more specialized niches. An example in coral reefs that Sarah G. talked about is the mutualistic relationship between dinoflagellates and corals. The dinoflagellate provides photosynthetic products to the coral, while the coral provides shelter to the dinoflagellates. In the rainforest, a symbiotic relationship Scott and I discussed is when leafcutter ants cultivate fungus gardens. The fungus breaks down the leaves that the ants can’t digest, producing nutritious swellings called gongylidia. In return, the fungus receives shelter and protection. Ultimately, the two ecosystems are more alike than I realized at first sight. Even though I had been to both a rainforest and coral reef before this course, I had never really connected the dots between the two. I had always separated them in my mind due to the obvious difference that one ecosystem is on land and the other is underwater. It was really interesting to look at them comparatively. Although there are some differences like coral reefs being more sensitive and susceptible to changing environmental factors when compared to rainforests, it’s become obvious to me now how much more they have in common. This course went above and beyond my expectations which were to learn about field work and to look at coral reefs and rainforests through a more scientific lens than I had while on vacation. While I did come away with a greater knowledge of the ecosystems and a better understanding of being a field biologist, I also created friendships and had the most fun I’ve had in a while. I feel extremely lucky to have been part of such an amazing group. It was so interesting to watch everyone become comfortable with each other to the point where it became non-stop laughing and joking around. That was definitely the best part of the trip for me. Honestly, the only downside I can think of is that the weather didn’t permit for a night dive. With all the snorkeling and scuba diving I’ve done, I have never gone in the water at night which I thought that would be neat, but oh well. I’ll definitely hold on to a lot of the things I’ve learned throughout the course, especially the experiential learning aspects of how science is done out in the field. It was fascinating to consider how many different directions a project can take, and how one observation can spark years of research. It’s kind of like how Therese’s work on defaunation in Gabon lead to her new project on seed-dispersal in Peru. I’ll also remember how important it is to talk to other people about their work. Scott and Adrienne really encouraged us to take advantage of where we were and to talk to the researchers at the stations. I’m normally not one to approach people I don’t know, but I made it a point to go out of my way to talk to the researchers at Glover’s and the archeology team at Las Cuevas. I’m glad I did because I got so much out of hearing their stories and listening to what they were working on. Lastly, I was completely surprised with how awesome ants are. To be honest, I wasn’t thrilled that I got ants as my taxon but I was quickly converted. I always thought it odd that my grandmother never killed the ants that crawled along the windowsills in her house, but now I understand. This trip ruined me – I’ll never be able to squish an ant again. Until next time, Belize. Hopefully I’ll be back soon to dive the Blue Hole and swim with whale sharks. Sorry Scott, Team Surf for life. I haven’t quite accepted that today is the last full day here at Glover’s. Although I know the rainforest will be a great experience, the Floridian/Cuban in me wishes I could stay here by the ocean forever. We took full advantage of the day, hitting three reefs over the course of about three hours. My favorite was “The Channel” by Long Caye. I saw at a spotted eagle ray from the boat, chased a Southern stingray across the sand, and glimpsed a spotted sun eel in the rocks. I saw a lot of soft coral on the reef, noticing that many of the fan corals (G. ventalina) were encrusted by fire coral. After that, we went to another part of Glover’s Atol called “The Aquarium” which is undergoing a phase shift and becoming overrun by algae. It was still beautiful, though. 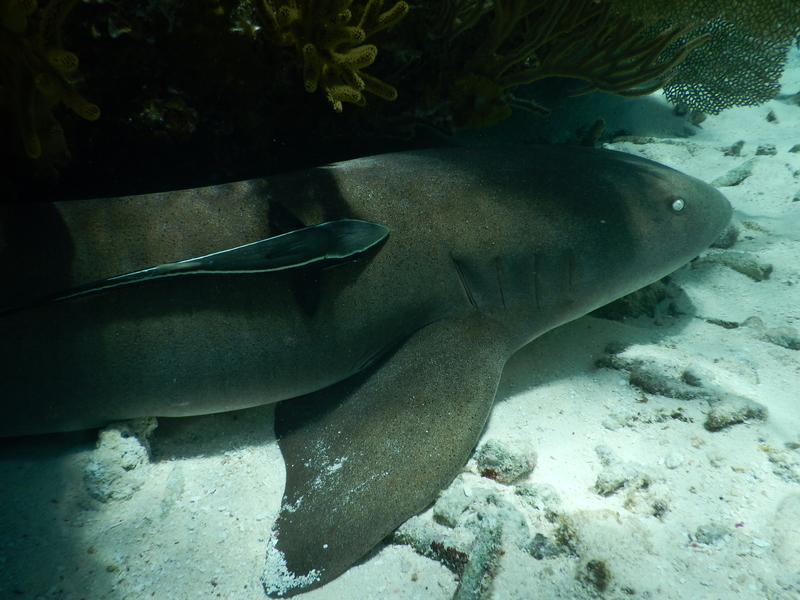 While there, I chased a nurse shark that had a remora on it and even saw a pair of Caribbean reef squid. In the afternoon, I gave my lecture on mangroves and seagrass beds in preparation for tomorrow’s excursion. 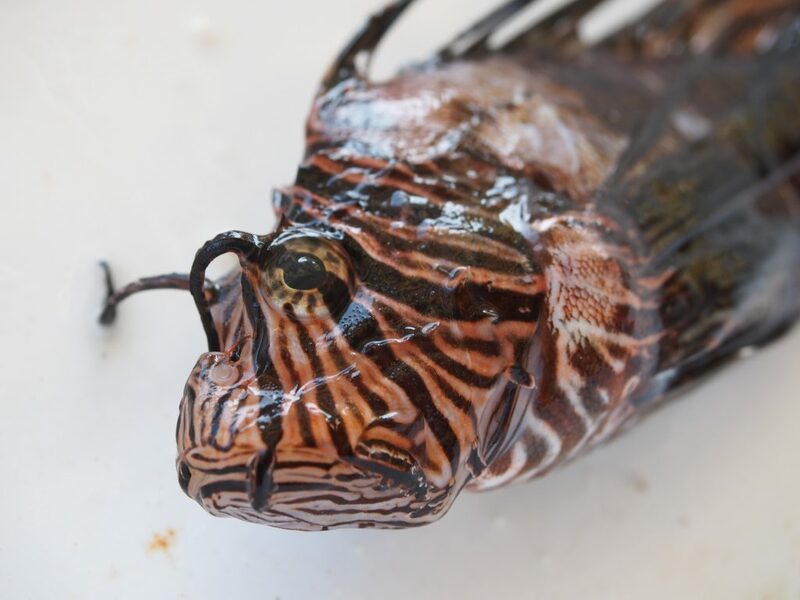 Then, I dissected Azlan the lionfish with Sarah T; in the spirit of full disclosure, having my hands full of fish guts wasn’t the most enjoyable. Afterwards, we as a class made our poster presentation quickly which gave us time to ride over to the resort at Long Caye. There, we ate delicious ceviche and (after bargaining with a fisherman for his shirt) came away with a class signed t-shirt that will (hopefully) hang in the cabana bar for memories. It has been such a fun afternoon full of laughing that ended with a beautiful sunset. I’ll be sad to leave here, but I’m really excited for all that’s still to come in the rainforest.